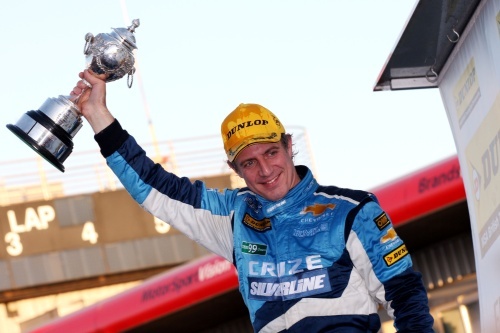 Jason Plato won twice on Sunday at Brands Hatch to be crowned Dunlop MSA British Touring Car Champion for the second time in his career as a 42,000 crowd – a record for a BTCC event – crammed into the Kent venue to see the final 2010 round of the UK’s premier motor racing series. Despite his Silverline Chevrolet Cruze carrying the maximum success ballast of 45kgs, Jason dominated the weekend with pole position on Saturday and lights-to-flag victories in today’s first and second races. His win in race two was enough to add a second title to the one he won, also at Brands Hatch, in 2001. Furthermore, it meant he has equalled Andy Rouse’s record of 60 race wins in the BTCC. The final win of the season, in race three, then went the way of youngster Andrew Jordan who, from pole position on a reversed grid, led all the way for his second win of the season – and his career – in the Pirtek Racing team’s Vauxhall Vectra, using BTCC organiser TOCA’s new turbocharged NGTC engine. He added: “When I first started in the BTCC in 1997 with the Renault team I knew we had a fantastic car and it duly won the championship that year. Mid-way through this season when we unlocked all the secrets of the Chevrolet Cruze I got that same feeling again. It has been a phenomenal car to race but, like I say, that’s very much down to the people at Chevrolet and RML. Personally, I am of course delighted. I've been runner-up three times in the last four years so to finally get that second crown probably means I won't be such a pain in the backside to live with now!"